As part of the brief, I've decided to use an additional element to the designs, as advised in the group crits. So I've using Lizzy's desired super-power, Time travel. However, I don't want to use the shape of a time machine in the images, as they're extremely complex. So i've decided to use shapes which correlate and represent time travel. Being a former film student, I thought I would turn towards the genius Alfred Hitchcock for some inspiration in my design. In his 1958, masterpiece, Vertigo, he uses a recurring motif, the spiral, as a means of communicating James Stewart's character's struggle to to escape the past. 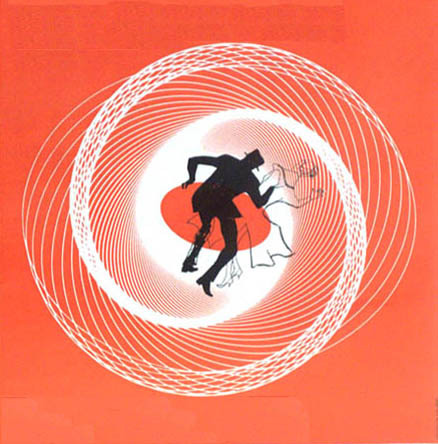 As you can see, a spiral, which shows an illustration of James Stewart's character falling into the past, being trapped there, metaphorically. This is Hitchcock's way of representing time, almost traveling from the present to the past. Hitchock also uses the motif in very subtle ways, such as in a hair style, a stair-case and through the rings in a tree, amongst others.